Tarr Steps is a 17 span clapper bridge (a bridge made of un-mortared stone slabs), the longest of its kind in Britain. It was first mentioned in Tudor times but we believe it may be much older. The natural ford at Tarr Steps is clearly an ancient crossing point, and the bridge was believed to be prehistoric, but with the damage caused by periodic flooding (the most recent being December 2012), its actual age is unknown. Some theories claim it dates from the Bronze Age (suggested by a convergence of track ways on the site); the most likely conclusion is it was built in the 15th or 16th century to provide a dry way across the river alongside a ford (probably providing access to a water grist mill). This is in line with early examples of clapper bridges on Dartmoor, which are associated with the tin working industry and have been dated to 1200s. Another suggestion concerns its connection with Hawkridge Church as images of the site record its use to carry coffins safely across the river. Whatever its age, this is a bridge steeped in legend – with associations with the Devil! Myth has it that the clapper bridge was built by the devil for the purposes of sunbathing, but a worldly wise parson negotiated with the Devil to allow the locals to cross when he was not in residence. 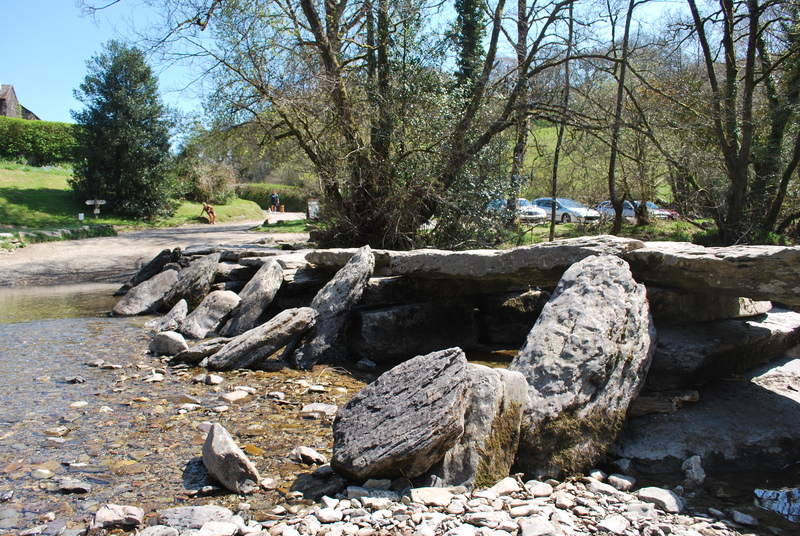 Tarr Steps – the construction makes is vulnerable to being washed away. Tarr Steps is 55 metres (60 yards) long, constructed from roughly hewn grit stone from the Pickwell Down basement beds. To form the bridge, large stone slabs (or “clappers”) sit on stone piers that rest on the river bed, protected from the current by raking stones. However this type of construction makes it vulnerable to flood and storm damage. English Heritage lists previous incidents in 1942, 1952 and 1979. Slabs weighing 2 tonnes have been washed as far as 50 metres downstream in previous floods, but the 2012 flood, when the River Barle’s water levels were 4 metres deeper than normal, was believed to be the worst in living memory. A central stone, laid crosswise, together with a distinctive arched shape used to mark the Parish Boundary between Dulverton and Hawkridge Parishes (the latter later merged with Withypool to form a much larger land unit) but this feature was lost after damage to the structure in the ice flood of January 1940. Historically farmers from both parishes carried out repairs to Tarr Steps and in 1945 a group of volunteers undertook strengthening works to the bridge structure. Restored in 1949 by 116 Army Engineer Regiment, floodwater completely demolished it in August 1952 (rebuilt in the summer of 1953). 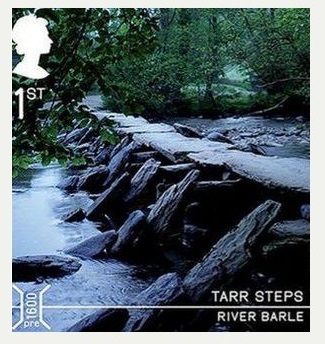 Last year to celebrate the evolution of bridge design across the UK, the Royal Mail published a set of stamps with the first one in the series being Tarr Steps. 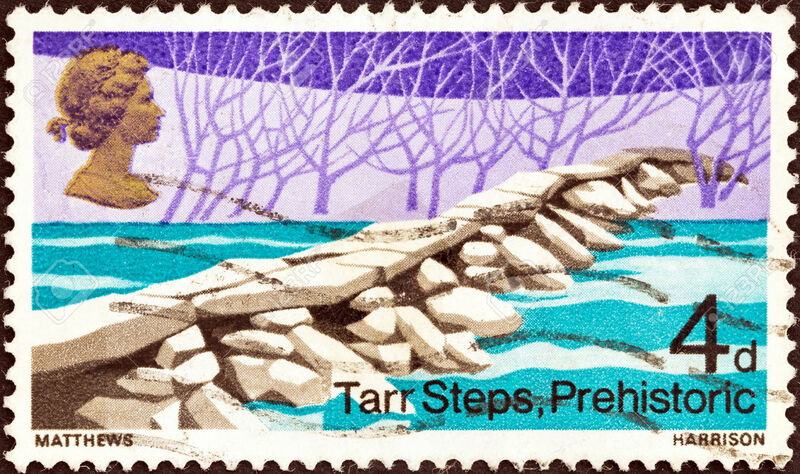 This is not the first time the bridge has been featured on stamps – it also appeared as part of an earlier set of stamps from 1968. To find out more about the heritage of Tarr Steps (and other parts of Exmoor National Park), visit our Historic Environment Website at www.exmoorher.co.uk. Alternatively if you want to explore up close, download our Dulverton to Tarr Steps Circular Walk leaflet.